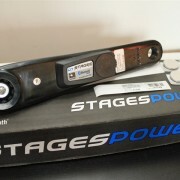 Come in to the shop to see close out specials on bikes and components with unbeatable prices. Not sure about how your new bike should fit or if your existing bike is set up correctly? We’ve got you covered. We’ll put you and your bike on one of our trainers or use our fit bike to dial you into a comfortable efficient position. Nothing will increase your riding enjoyment or performance like a perfectly fit bike. 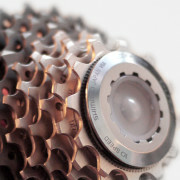 At Veloworx we only sell products we believe in. Every component we sell is chosen for it’s performance and durability. We have a huge selection of small parts that you just can not find at other shops. Let’s not forget about your on the bike wardrobe. We offer outstanding clothing from Descente, Sugoi and Giordana. We can set you up with a great pedal and shoe combo complete with cleat positioning. And please wear your helmet! Choose a cool lid from Bell or Giro. If you like one on one service with a relaxed atmosphere then Veloworx is your shop. We want to get you riding and keep you riding for years to come. Cycling is our lifestyle, come in and see for yourself. After getting tired of the large chains and discount stores’ lack of personal attention, we felt there was a strong need to open a boutique bike shop on the west side. With that vision always in sight we created Veloworx. We opened in January of 2003 and a strong grass-roots buzz has been growing ever since. We specialized in high end products and boutique items that you may not find in other shops, as well as being your friendly neighborhood family store. We have an expert staff with knowledge in all aspects of cycling whether it be road, track, mountain or anything else you can do on two wheels. Personal service is what we do best. 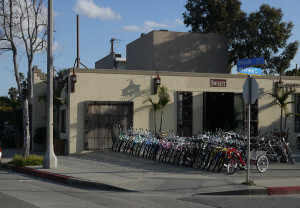 We have the best mechanics in town and many times can have your bike serviced the same day you drop it off. We can also track down any part or accessory you may want. 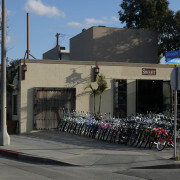 We are located at 3106 Lincoln Blvd at the edge of Venice in Santa Monica. Our phone number is 310.584.9797. We look forward to helping you with your bike soon.